I was thrilled to pay off one of two credit cards last fall, and as of last week, I hadn't touched the thing. Then I got a letter from my bank, announcing a pretty incredible limited time bonus -- 5 percent back on travel-related purchases made by March 30. The bonus just so happened to be for the card I hadn't used in months. And it was no coincidence either. We all know that red flags like late payments, too many lines of open credit, and a mountain of student loan debt can knock dozens of points off credit scores. But what about the little-known ways banks and lenders are judging us -- even those of us who are "low-risk" clients? With help from Adrian Nazari, CEO of CreditSesame.com, here are five ways every credit customer is judged, whether they like it or not. When lenders size up potential borrowers, they aren't just looking at how much they spend, but where they spend as well. If you've gotten a letter in the mail congratulating you on a freshly-inflated credit limit (or a new cash-back bonus like I did) chances are your lender has noticed you've been diligently paying off your card and selectively shopping where you can afford to. "For example, if you normally shop at high-end stores and regularly pay off your card, and then suddenly start shopping at discount stores and carrying a balance, the lender could use this behavior data as an indicator that you have become higher risk and could take steps to minimize its exposure," says Nazari. "Alternatively, if your behavior data indicates you are a good risk but you aren't generating a profit, an issuer might determine how to incentivize spending." How to improve it: Since Behavior Scores are based on triggers like long-term credit card activity, late payments, limit breaches, and fees, if you can figure out how to improve these, you'll be able to beef up your score. FICO uses this score to help creditors find the "diamonds in the rough," says Nazari. "Those slightly higher risk prospects [who] have the potential to be highly profitable customers. In other words, this score allows lenders to determine how profitable you are to them and market to you accordingly, which could include offering you deals that incentivize spending." How to improve it: There's not really much you can do here, Nazari notes. The revenue score just helps the lender tailor its marketing strategy to your specific needs -- and weaknesses. Despite its title, this score isn't used to lower scores when consumers file for bankruptcy. Instead, it's a carefully formulated algorithm used to predict how likely they are to go bankrupt. "This score is usually generated when you open a new line of credit and you give the creditor permission to pull a credit report," says Nazari. "This score helps creditors assess and minimize their risk in advance, and allows banks, which are required by law to keep a certain amount of 'bad debt reserves' on hand, to lower that amount." How to improve it: Nazari's advice: "Pay your bills on time, keep debt balances low, open accounts only when necessary to avoid excessive inquiries on your credit report, and monitor your credit report regularly to ensure it is accurate." 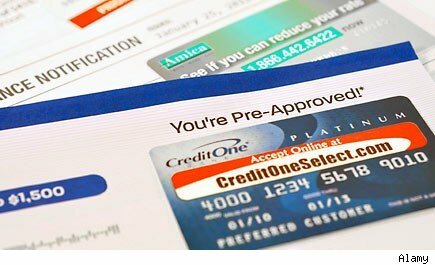 Until recently, credit report monitoring has been a costly (and not entirely necessary) service for consumers. But now Credit Sesame and Credit Karma both offer the service for free. Your credit score doesn't just drop when you have debts sent into collections. How likely you are to pay off those debts can determine whether collectors will harass you or not. "The lower your collection score, the less likely a debt collection agency is to aggressively pursue you because the agency doesn't want to waste valuable resources trying to collect debt that is unlikely to be recovered." How to improve it. Simple: Don't let your debts go into collections. And if they have? Don't panic. Follow through with each phone call, ask if they are willing to negotiate, and keep a clean paper trail throughout. For unnecessarily aggressive collectors, don't hesitate to alert the CFPB or FTC. If all this wasn't creepy enough, the attrition score is also known as the "Wandering Eye" score. It's how lenders decide how likely it is that you'll "cheat" on them with another competitor. "When this score is high, it tells lenders that they may need to sweeten the pot and offer you various perks so they can continue to make you happy and committed," Nazari says. How to improve it. We're not sure you'd want to worry about this one. In fact, it could be good for you to make your lender a little jealous from time time. "You want your credit card issuer to think you might abandon them for a competitor so they'll work a little harder to keep you," says Nazari. "Calling your issuer to request lower rates or balance transfer information can let them know you might be in the market to make a switch. If you use your credit card regularly, another way to let them know they need to court you again is to simply stop using your card." At What Point Does Student Loan Debt Become Too Great To Handle?